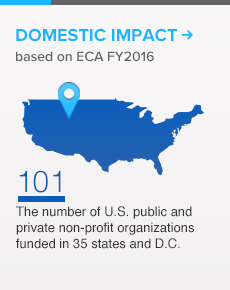 Around the world, ECA programs continue to grow and make significant contributions to the areas that will matter most to future generations. Below, you can explore facts and figures on ECA's history, growth and notable alumni. 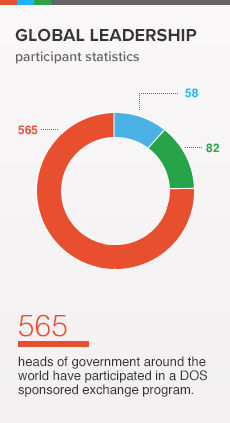 Number of partnerships that GSMP alumni have formed to implement sport-based community development initiatives. from 53 countries participate in U.S. Department of State and espnW GSMP on women’s empowerment. have participated in workshops or events associated with GSMP alumni Action Plans. have founded a new organization or working group for a total of 80 new organizations. of GSMP alumni have received at least one award, promotion, or achievement. of female Nobel Prize winners since 1940 have been alumni of exchange programs. of YES participants volunteered during their time in the program. Host ECA participants, all of whom support the local economy during their stay. Are on exchange programs funded by the State Department annually. Volunteered each year by Americans for exchange programs. Number of 2013 J-1 Visa participants coming to the U.S. from more than 200 countries and territories. Pass rate of the 2012-2013 E-Teacher Program courses. Community service performed by FLEX students over time. Number of E-Teacher scholarships granted since 2009. Participated in the A-SMYLE, FLEX, and YES programs in the 2012-2013 school year. Have hosted Future Leaders Exchange (FLEX) participants. of the International Exchange Alumni online community. have participated in a DOS sponsored exchange program. Representatives to the United Nations. Current or former heads of foreign governments. Have been visited by Sports Envoys since 2005. Have been involved in the two-way International Sports Programming Initiative program since 2002. Around the world have come to the U.S. for a Sports Visitor program since 2002. Number of Fulbrighters who have received the U.S. Presidential Medal of Freedom.